A dance performance which in its vernacular corresponds with the theatrical world of contemporary puppet theater. In a series of “if only” scenarios, Object Theater artist Meital Raz and choreographer Lee Meir practice in preparation for life. In their joint-imagination, they work on their survival skills and prepare themselves for the worst. By observing the principles of play in children and animals, they learn how to play with total commitment, but are also perplexed by the level of seriousness with which they have to play, and what it’s like when playing is no longer fun anymore. A two faced performance where everything is irreversible, but also reversible, and is ultimately only a game. 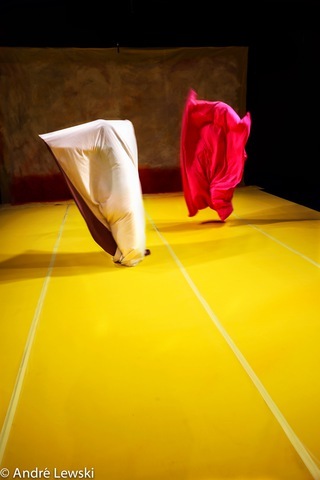 CHOREOGRAPHY AND PERFORMANCE : Meital Raz and Lee Méir/ DRAMATURGY: Yael Biegon-Citron/ ARTISTIC ADVICE: Idit Herman, André Lewski/ STAGE AND COSTUME DESIGN: Anat Maratkovich/ PRODUCTION: Meital Raz and Lee Méir, Clipa Theater Tel-Aviv, Diver Festival Tel-Aviv/ RESIDENCY AND SUPPORT: CC – Choreographic Center Heidelberg / Supported by the Israeli Lottery Foundation. "… Genuinely, like only children do, the two performers lay out their longings and fears, share memories and casually invent new games. The whole piece is hilarious and deeply serious, graspable for all ages and executed with a wonderful sense of timing, facial expression and gestures "